Maybe you were tasked with managing your company's social media accounts because you're the marketing guy or maybe because you're youngest staffer and therefore deemed the most social media savvy. Whatever the reason, you're stuck with it—but posting to your company’s Twitter feed is likely the first thing to drop off your to-do list when the work piles up. 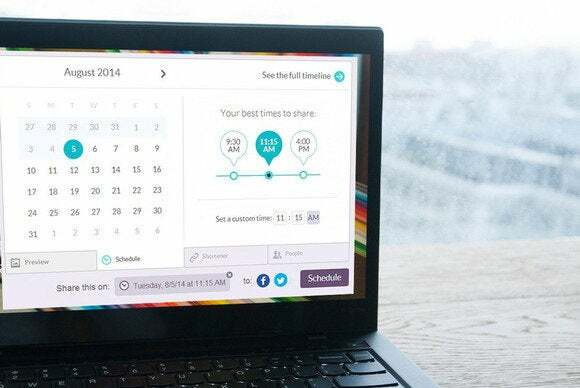 If that's you, it's time to embrace a social media scheduling service. With these tools you can keep your tweets and status updates flowing even when you're stuck in your third meeting of the day. Just remember a couple of golden rules when it comes to scheduling posts: Don’t schedule everything, be prepared to engage when your scheduled posts go live, and stay on top of current events and trending topics. If you’re just getting into the tweet-scheduling game, FutureTweets is about the most straightforward scheduling service you can ask for. 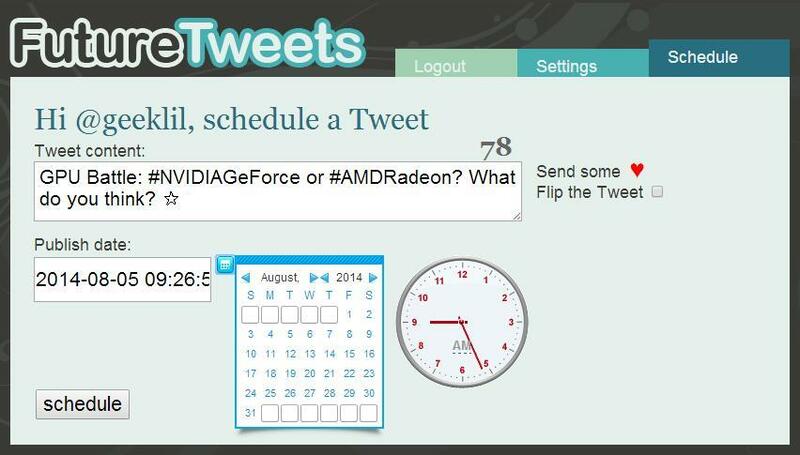 Just type your tweet, choose your publish date and time (you can enter these manually or use the provided pop-up calendar and analog clock), and hit the schedule button. FutureTweets offers easy, basic scheduling for your Twitter account. Below the tweet box, you can see a list of your current and past scheduled tweets—the first have have gold stars next to them, the second have green checkmarks. You can delete or edit a tweet by clicking the appropriate icon next to it. FutureTweets is a great service for people who want to schedule a few tweets quickly without having to go through the hassle of signing up for a completely separate social media management tool. But it’s limited: There’s no easy way to add pictures to your tweets, and there’s no built-in link-shortening service. So if you’re planning heavy social activity, you may want to look at a more powerful service. This service ranks users according to their social media “Klout,” which it measures using an algorithm that considers both the size of your network and the amount of influence you have over your followers. Earlier this year, Klout started putting its analytics to use with a brand-new sharing feature. You can sign up with either your Twitter or Facebook account, and you can add social networks—including Google+, Instagram, Blogger, and Tumblr—to your profile to generate a more accurate Klout score. Sharing content from Klout is simple: just start typing in the text box at the top of the screen. You can share content on Twitter, Facebook, or both. The sharing box offers several features, including the ability to add photos, shorten links, and tag people (Twitter users only). Klout will even offer up your “best” times to share, which it determines by looking at how your shared content has been received by followers in the past. 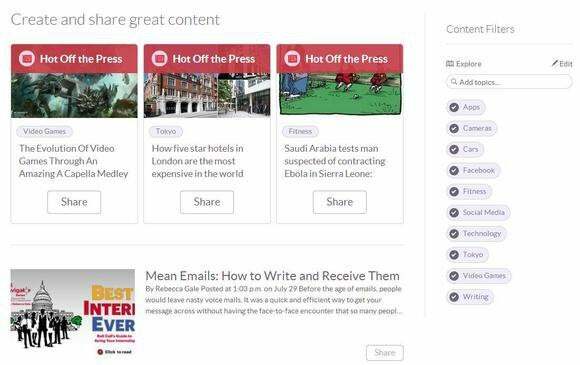 Klout can suggest content for you to share on your social networks. Klout can even help you decide what to share. Click “Create” in the left menu, and Klout gives you a curated list of trending content based on your interests. You can add and remove interests in the Content Filters section, and you can also filter through content by selecting and de-selecting different topics. Klout highlights recently-published content as being “Hot Off the Press,” so you can jump in and be a conversation-starter. Klout requires a little more investment than FutureTweets. It’s a great choice, though, since it offers useful analytics-based tools, which take some of the guesswork out of your social media strategy. If you’re working for both yourself and another business, though, you’ll need to set up a separate Klout accounts—Klout only lets users add one of each network per account. Social media managers swear by HootSuite for a reason: It’s one of the most robust social media management tools around. HootSuite lets you schedule posts across multiple networks and also offers a quick “AutoSchedule” feature for people who are more concerned with having a constant stream of updates, rather than choosing the exact day and time. HootSuite’s main screen focuses on customized streams from your various social networks. A stream might be, for example, Twitter @mentions, Twitter Direct Messages, or Facebook News Feed Photos. The streams screen is also divided into tabs, so you can group similar streams together. 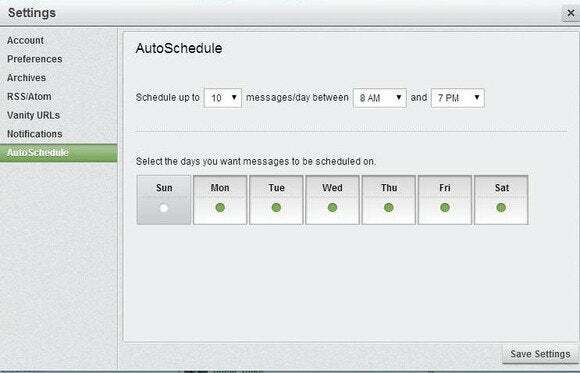 HootSuite's AutoSchedule feature automatically posts for you at predetermined intervals. To post from HootSuite, simply start typing in the text box at the top of the screen. The text box will expand so you can choose which profile to post from. If there’s one profile you use frequently, you can “pin” it, and it will be the default whenever you type an update. HootSuite offers link shortening and the ability to add images, files, and locations, as well as options to target specific countries on Twitter. You can also choose privacy options when posting to Facebook or Google. HootSuite lets you choose a day and time (you can pick minutes in increments of 5) and gives the option to have an email sent to you when the post publishes. All currently scheduled posts can be found in the Publisher menu, where you can edit, delete, or reschedule them before they go live. HootSuite’s AutoSchedule feature automatically posts tweets between certain hours on certain days (customizable in the AutoSchedule menu) and spaces them out so you’ll reach the largest number of followers. For example, you can set up AutoSchedule to post five posts per day on weekdays, between the hours of 8 a.m. and 5 p.m.
HootSuite is more complicated and takes longer to set up than the other services in this round-up, but it’s worth the extra legwork. Free users can add up to three social networks to one HootSuite account, including LinkedIn, Google+ Pages, and Foursquare. HootSuite Pro starts at $8.99/month and lets you add up to 100 social network accounts/profiles and bulk schedule up to 350 updates at once by uploading a spreadsheet.